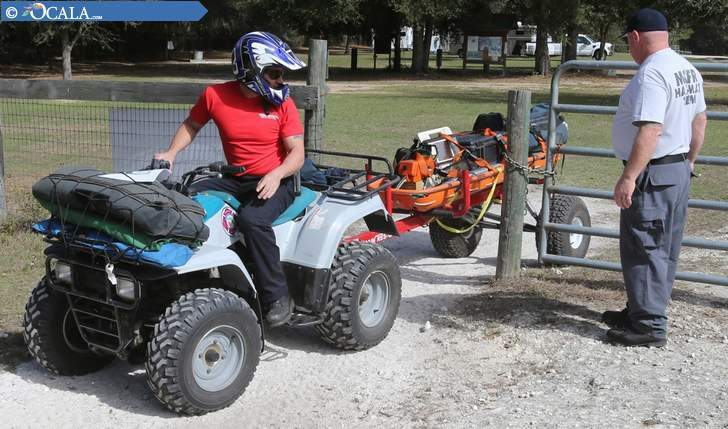 "Mick Jasper, left, and Lt. Joe Fitzpatrick of Marion County Fire Rescue pull an ATV through a gate as they respond to a mock emergency call during a training exercise at the Marjorie Harris Carr Cross Florida Greenway Land Bridge south of Ocala on Friday. 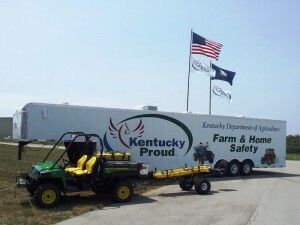 New All Terrain Res-Q off-road patient transport trailer donated to the Kentucky Department of Agriculture's Farm & Home Safety Program. 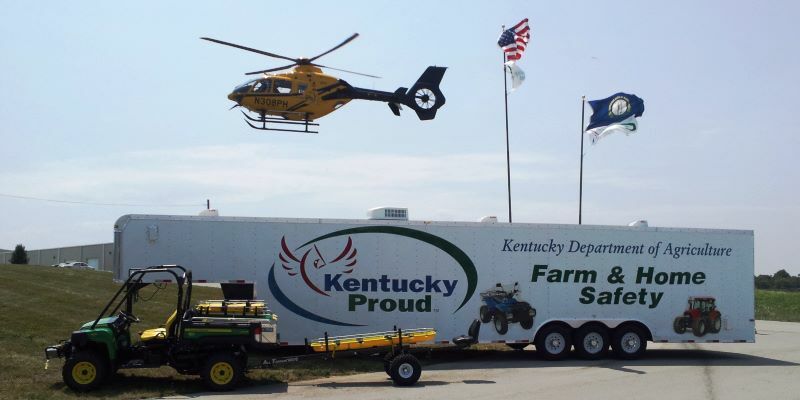 These images of a perfect midsummer afternoon in central Kentucky were taken last week behind the Kentucky Department of Agriculture's (KDA) building in Frankfort, KY. Several officials from KDA and EMERGENCY EQUIPMENT gathered to commemorate donation of a new 'All Terrain Res-Q' (ATR) off-road patient transport trailer to KDA's Farm & Home Safety Training Program. Along with the rescue trailer, a new JUNKIN basket stretcher was provided to complete this patient transport system. Also, the ATV tires on this 'ATR' are equipped with 'TireBalls' Run-Flat tire protection system donated and installed by 'The TireBall Company'. The 'ATR' is towed by a John Deere 4X4 Gator 825i XUV donated by DEERE & Co., and outfitted with a 'MedLite' EMS / Rescue insert donated by KIMTEK Corp. The MedLite insert has a JUNKIN 'break-apart' stretcher and 'TURTLE Tile' matting installed on the stretcher deck provided by ///EMERGENCY EQUIPMENT. This picture represents a great example of "Public - Private Partnerships" at work. Thank you to all who made this happen! May 31, 2012, ///EMERGENCY EQUIPMENT delivered the All Terrain Res-Q off road patient trailer featured under 'What's Hot' on FR1's off road rescue page to the City of Pikeville Fire & EMS. This refurbished ATV rescue trailer was previously in service with Kentucky Dept. of Agriculture's Farm and Home Safety Training Program. Originally donated to the program as replacement for the first 'ATR' trailer provided in 2007, this rescue trailer was purchased by City of Pikeville Fire & EMS in Eastern Kentucky. During the delivery an 'ATR' orientation session was held with on duty Pikeville Fire / Rescue personnel. These individuals will act as instructors for the remainder of the department as they take on their new off road rescue responsibilities. The significance of this event is two fold. 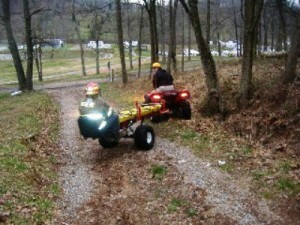 On April 23, 2006, the first 'ATR' demonstration trail ride took place on a trail behind Pikeville FD's station #1. In 2006, Kentucky led the nation in ATV accident related fatalities, and Pike County had more fatalities than any other county in the state. However, with tight budgets and higher priority equipment in need, this 'ATR' had to wait. Now, six years later Pikeville's is the 35TH 'All Terrain Res-Q' trailer in the state of Kentucky, and the second 'ATR' trailer serving in Pike County. The City of Pikeville Fire & EMS will use the 'All Terrain Res-Q' off road patient transport trailer behind their 2008 Kawasaki 3010 Trans4X4 Mule. As their Mule is outfitted with a compressed air foam system (CAFS), the 'ATR' allows Pikeville FD to transport patients without the need to give up their off road fire suppression capabilities. In September 2009 we submitted a grant to the Regional Emergency Medical and Trauma Advisory Councils (RETAC), under the State’s Emergency Medical and Trauma Services (EMTS) department for two tracked ATV vehicles to augment our winter rescue capabilities. We were denied that grant. Undeterred, we again submitted a grant request to the same entity this February for a single tracked ATV and a rescue trailer to transport injured subjects and also requested 70% matching funds. That grant of $12,700 was awarded to CCSAR on 30 June, 2010. In July of this year Custer County awarded CCSAR $6000, from leftover conservation funds, to complete the purchase of the ATV and Trailer. This fall we purchased a 700cc Yamaha Rhino with tracks from Fremont Motorsports in Florence, CO. In addition, we bought an ATR-2 rescue trailer from All Terrain Res-Q in Cortland, NY. This equipment will greatly expand our winter rescue capabilities. We expect that the ATV will deliver two rescuers to the rescue site and be able to retrieve at least two subjects (one injured and one ambulatory). It will also carry rescue equipment and a litter to and from the site. We also expect it to perform in situations where a snowmobile would not be effective, such as heavily treed or rocky terrain. The tracked ATV will operate effectively in snow depths three times that which renders a snowmobile immobile. We expect to use this ATV year round. 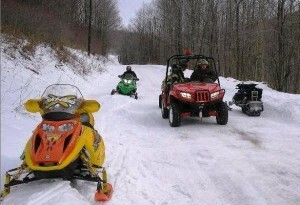 It will perform better than a wheeled ATV in muddy spring conditions – especially where there is deep snow and bare ground along the roads or trails. The sheriff’s office is asking CCSAR to perform more welfare checks on residences in remote areas during extreme winter conditions. The sheriff expects our welfare check calls to increase by 50% now that we have this capability. We will measure the success of these vehicles by the reduced time required to get responders and equipment to the subjects. In past years, a winter mission would require the “hasty” team to snowshoe through three feet of snow, with very heavy packs of equipment, for 3-4 miles on a road before going off road to get to the subject. This would require about 4 hours. We expect the response times to be closer to one hour when these vehicles are employed. The improved response time can mean life or death for the subject. Story Courtesy of Bud Bennett, Treasurer CCSAR. Photo Courtesy of The Wet Mountain Tribune. Eldred Boro FD's Rescue 45 and All Terrain Res-Q Completes Mutual Aid Off-Road Rescue Mission Despite Icy Roads and Apparatus Breakdown! 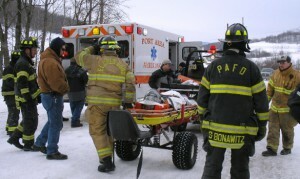 Almost three years to the day after Eldred Borough FD, Station - 4, McKean County, PA, received their 'All Terrain Res-Q' off-road patient transport trailer, Eldred's Rescue 45 was dispatched to assist Port Allegany Fire Department and a Port Area Ambulance at the scene of a snowmobile accident. Another mutual aid call, Eldred Boro FD personnel hitched their 18-Ft. off-road rescue hauler to 'Utility 44' and responded to an area of snowmobile trails at the end of Two Mile Road, 13 miles away in Annin Township, outside Port Allegany. The 911 caller, a witness to the accident, did not know their exact location on the trails. So, the McKean County 911 Dispatch Center traced the cell phone signal using Enhanced 911 to determine the location of the scene was a 1/2 mile off the nearest paved road. Unfortunately, icy road conditions prevented first responders from reaching the closest access to the accident scene. So, staging was established at the bottom of a hill 1-1/2 miles away. Upon arrival of Port Allegany FD Rescue 38, their personnel and medical equipment was transported to the accident scene by two private citizens on snowmobiles. As the patient was being stabilized by Port Allegany rescuers, Eldred Boro FD's Rescue 45 crew were confronted with their own emergency. Still 2 miles from the staging area, Utility 44's turbo blew and the F-550 Brush Truck towing the off-road rescue equipment hauler came to a halt. However, quick thinking Rescue 45 members dropped the hauler's ramp and finished the remainder of their emergency response on board their Arctic Cat 650 Prowler with an All Terrain Res-Q trailer in tow. Further complicating the response was an air temperature of just 7 degrees combined with traveling at close to highway speed, without the benefit of a windshield on the UTV. Upon their arrival at the staging area Rescue 45 was directed to the trail. Access to the snowmobile trail required climbing a very icy hill, and crossing a 3-Ft. high snow barrier. Once on the trail, Rescue 45 encountered several humps and bumps en route to the accident scene and Rescue 38's patient. Shortly after Eldred Boro's Rescue 45 reached Port Allegany FD's Rescue 38 personnel on scene, the patient was loaded onto the All Terrain Res-Q trailer and carefully transported almost 2 miles back to the staging area. At staging, the patient was provided ALS care and transferred to a Port Area Ambulance and Medic 16 for transport to the LZ where STAT-9, a medical helicopter was standing by. 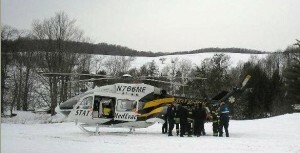 Once the MedEvac helicopter was airborne all Port Allegany FD, Port Area Ambulance and Eldred Boro FD units returned to service. Without proper training, equipment, cooperation and pre-planing for off-road missions like this, the victim may not have made it off this remote snowmobile trail alive. 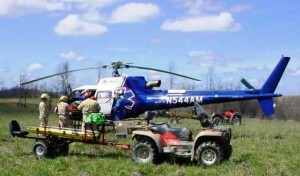 The combined efforts of McKean County 911 Dispatch Center, Port Allegany Fire Department, Port Area Ambulance, Eldred Boro Fire Department, the crew of Stat - 9 MedEvac and 'All Terrain Res-Q Trailers' made it happen! 2008 a Busy Year for Lake City Fire Company and All Terrain Res-Q! the Lake City Fire Company in northwestern Pennsylvania purchased their new All Terrain Res-Q Trailer in March 2008, they knew it would be a useful addition to their Kawasaki Trans 4X4 Mule off-road rescue vehicle. But, no one figured on 7 dispatches for off-road response in their area, including: 3 patient transports, 2 cancels, 1 special event stand-by, and 1 rescue turned recovery in just nine months with this equipment. It was Lake City FC's most recent rescue dispatch that turned into a recovery mission. Most of us were safe and warm at home enjoying the Thanksgiving Day parades on TV the morning of November 27, 2008, at 10:00 AM. About that time, Lake City FC units were dispatched to reports of "A man down near the Elk Creek tubes." The tubes are large concrete and steel 30-Ft. diameter culverts that allow the waters of Elk Creek to flow under an elevated earthen railroad trestle as they flow north into Lake Erie. Squad 577, Rescue 579, West County Paramedics, and Utility 566 with the Mule and Res-Q trailer responded to the call. Staging was an area off North Creek Road near the railroad tracks about a quarter mile southeast of the scene. While the first in rescue crew made its' way to the trestle and down the embankment, Utility 566 unloaded the Mule and Res-Q Trailer. LCFC rescue personnel found the patient on the bank inside one of the tubes with no signs of life. As such, the rescue was reclassified a recovery mission. Considering the remote location, LCFC rescue personnel prepared for a difficult removal. LCFC's second in crew donned water rescue PPE and set up a rapid deployment craft (RDC), with a basket stretcher, for transport to the creek by the Mule and Res-Q trailer. A 3 member RDC crew entered the icy waters and made their way to the victim inside the culvert. They loaded and secured the victim in the basket stretcher, then loaded the stretcher onto the RDC for transport downstream where the Mule and ResQ trailer had staged. Once on shore, the RDC crew transferred the basket stretcher with victim to the ResQ trailer. Then, the four passenger Mule transported the RDC and crew, the victim, and a Paramedic back to the staging area. Most rescuers are pre-programed to save lives whenever called upon to do so. However, at times we're asked to perform our services with no hope of saving a life. Rather, we're asked to effect a recovery; a "body removal." As rescuers, we then switch gears and consider the service we are performing is not for the benefit of the deceased, but for the 'peace of mind' of surviving family members. This article is about one such recovery in a small Eastern Kentucky community outside of Hyden known as Hurricane. At 7:45 PM Tuesday evening October 28, 2008, Leslie County Sheriff's Deputies were dispatched to a residence on Wendover - Hurricane Creek Road. It was reported "a family member had found their father on the ground some distance back in the woods." Responding deputies found obvious signs of death on the victim, so the Leslie County Coroner was dispatched to the scene. Familiar with the rugged terrain of the area, dispatchers suggested that Cutshin Fire/Rescue's 'ATV Rescue Team' be toned out as well. Knowing the off-road patient transport capabilities of Cutshin's team, the Coroner agreed. Also, Thousand Sticks VFD with their ARGO 8X8 off-road / amphibious vehicle was dispatched to assist. The ARGO can seat up to 6 personnel and carry 1000 pounds of equipment on land. As such, this vehicle was used to transport additional personnel and gear. Upon arrival at the residence, Chief Michael Joseph, Cutshin Fire & Rescue, was advised of a male 52 years of age, that had been found on the ground at the base of a tree, under a deer stand. The actual scene was approximately 1-1/2 miles up a rough cut trail that snaked it's way up the mountainside from behind the house. Chief Joseph checked topographical maps of the area and noted the elevation at the residence was about 1000 feet. Also, Joseph observed that the trail switched back and forth for over a mile before reaching the scene which was near the 1600 foot elevation contour. After briefing his team, a Yamaha Rhino with rope rescue equipment and Cutshin's 4X4 Suzuki 500 ATV with an 'All Terrain Res-Q' patient transport trailer started up the narrow winding trail. Arriving on scene at 8:30 PM, the 'ATV Res-Q Team' waited for Sheriff's Deputies and the Coroner to complete their on-site investigation. By 9:15 PM, the victim had been packaged into a basket stretcher and securely loaded onto the patient transport trailer for the trip down the mountainside. Just 20 minutes later, at 9:35 PM, Cutshin's 'ATV Res-Q Team' safely delivered the deceased to a waiting hearse. Realizing the 1-1/2 mile long 600 foot decent over a rough cut trail required only 20 minutes to perform, both Sheriff's Deputies and the Coroner remarked how in the past recovery missions like this took over 3 hours and involved 8 to 12 additional personnel just to perform the carry out operation. As most readers on this website already know, when all the evidence points to the improbability of the continued survival of the subject of a search or rescue, we in the business of "emergency response" are faced with the complex decision of changing the status of a mission from a "rescue" to a "recovery." It's at this critical moment when the Incident Commander decides to change the focus of a mission from "saving a life" to "providing closure for family and friends of the presumed deceased," while limiting additional risk to rescue personnel in the process. Anyone who has made this decision, has done so only after careful consideration, usually over an extended period of time. If we perform this act professionally, with dignity and respect for the victim's body, and consideration for the safety of all involved, the emotional impact on family and friends is reduced. Sometimes, that's the best we can hope for. This article tells of a rescue mission that changed to a recovery in an instant; but with the added complexity of having family members already on scene. At 22:55 hours on Wednesday, June 18, 2008, the Grapevine - Chavies VFD received a dispatch from Perry County, Kentucky E911 Center. The dispatch stated: "A 911 caller was reporting a man who had been 'ginsenging' on a mountainside north of Chavies was now trapped, and they needed a basket stretcher to get him out." Upon arrival at the scene as it was dispatched, assistant chief Ben Stidham, a FF/EMT, was told the patient was 200 to 300 feet over the embankment where a man with a flashlight was signaling them. Given this information, Stidham proceeded down the embankment until he reached the man with the flashlight. At this point, Stidham was informed that the victim was another 500 feet down the mountain with his brothers at his side. After assessing the terrain, it was determined there was no established trail down to the position of the victim; in reality, it was a cliff. So, Stidham carefully proceeded ahead of other rescuers until he made contact with the patient's brothers. It was at this point that Stidham was informed by the victim's brothers that he (the victim) was, in fact, deceased. The brothers reported the last communication with the victim had been over 12 hours earlier. At 9 PM, about dark, the family began to look for him. Upon locating the victim almost 2 hours later, one of the family called the 911 center and requested assistance. However, because of the separation between the on-scene family members and the 911 caller, the patient's condition was not accurately conveyed to the dispatcher. Now past midnight, and finally on the scene, Stidham changed the status of this mission from a "rescue" to a "recovery." He directed his personnel to reposition to an old washed out coal road about 1000 feet below their present location. Once the road was located, a command post was established at the point where the road became impassable by conventional 4X4 vehicles. The Grapevine - Chavies VFD transported their Yamaha Rhino 4X4 "Side-bySide" off-road vehicle and "All Terrain Res-Q Trailer" to the combined CP and staging area, just inside Breathitt County, Kentucky. Three hours later, with assistance from the Pine Branch Coal Company, and members of the victim's family, the deceased was brought out and delivered to the Breathitt County Coroner where he was officially pronounced dead. It was later determined that this recovery required a combined round trip of 16 miles traveled over a washed out coal road and a steep mountainside, almost impassable by off-road vehicles. What could have taken +16 hours was achieved in just under 3 hours with the right equipment. In the words of an on-scene paramedic, "It (the Yamaha Rhino and All Terrain Res-Q Trailer) was the only way to get it done!" Grapevine-Chavies VFD'S ATV Rescue Team Performs 1st Off-Road Rescue One Week After Receiving Equipment -- On One Of Their Own! On Saturday, April 5, 2008, members of the Grapevine - Chavies Volunteer Fire Department's new "ATV Rescue Team" took delivery of an All Terrain Res-Q Trailer from ///EMERGENCY EQUIPMENT at the Knott County ATV Safety Training Center. Built by the Empire Welding & Fabicating Co. of Cortland, New York, the purchase of this life saving equipment was funded by YAMAHA Motor Corporation, USA. The day before, their local Yamaha dealer, 'Andy's Cycles of Hazard, Kentucky,' arranged to provide the new ATV Team with a Yamaha 660 Rhino UTV as a tow vehicle for their new off-road rescue trailer. So, on Thursday, April 10, 2008, Mike Brady from ///EMERGENCY EQUIPMENT conducted an ATV Rescue Trailer "Orientation Session" at their fire station in Chavies, KY. One of the members present for the training was Captain Eric Pratt. Pratt, a volunteer firefighter for Grapevine - Chavies VFD, is also a lineman for the Elliott Power Company in Perry County, Kentucky. During the orientation session, Brady emphasized the need for ALL the rescue team's ATV / UTV operators to experience what it's like to be a patient being hauled out on an All Terrain Res-Q Trailer. So, Pratt (all 6'-4" / 375 lbs. of him) laid himself in the basket stretcher and was "taken for a ride" on the new off-road patient transportation device. Now, fast-forward just two days later, when an adjoining agency, the Jakes Branch VFD, receives a call for help from a "power line worker injured on the mountain above Lost Creek" while replacing a power pole damaged during a recent storm. Hearing the dispatch, and knowing the terrain, Assistant Chief Ben Stidham of Grapevine - Chavies VFD offers the services of their new "Off-Road Rescue" equipment to Jakes Branch VFD. Fortunately, the offer is accepted. After a lengthly "technical / rope rescue operation" the patient was delivered to the "ATV Rescue Team" from Grapevine - Chavies VFD. Still over a mile from the nearest landing zone, the Grapevine - Chavies VFD ATV Rescue Team crew had to take a seriously injured worker over rough terrain to a waiting "Wings Air Rescue" helicoptor so he would have the best chance for survival. What made this first run more difficult was it involved one of their own! Yes, Captain Eric Pratt, Grapevine - Chavies VFD, was the lineman severly injured when a power pole fell on him while working to restore power to Perry County residents on a steep mountainside above Lost Creek, Kentucky. Even when untrained off-road rescuers expressed concerns over the stability of the All Terrain Res-Q Trailer, the Grapevine - Chavies ATV Rescue Team crew relied on their training, and safely delivered the injured worker, and fellow firefighter, to the WINGS MEDEVAC helcopter LZ. Unfortunately, Kentucky continues to lead the nation in All Terrain Vehicle fatalities. However, a group of dedicated professionals are working to change that. So, on a cold, wet and windy early spring Saturday morning in the mountains of southeastern Kentucky, instructors from the new Kentucky "ATV Safety and Rescue Training Program" gathered to participate in the first ever "ATV Safety and Rescue R&D Weekend." The purpose of this gathering was to better understand what the ATVs and UTVs used in this program could do, and perhaps more importantly, what they could not do. 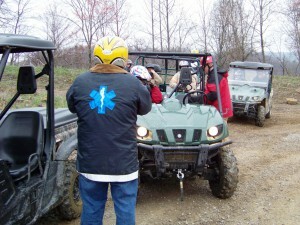 The site for this unique gathering was the new "KNOTT COUNTY ATV SAFETY TRAINING CENTER" at the Sutton Memorial Park, located near Vest, in Knott County Kentucky. As the weekend itinerary commenced, the first event was presentation of an All Terrain Res-Q Trailer for use in the training program's ATV Safety & Rescue classes planned to be taught to emergency responders statewide. Mr. Dale Dobson, program coordinator for the Kentucky Department of Agriculture's "Farm and Home Safety Training Program" accepted the off-road rescue trailer from Mike Brady, of ///EMERGENCY EQUIPMENT, the master distributor for All Terrain Res-Q. Brady stated: "With 64 of these life saving off-road rescue trailers now serving in 26 US states, All Terrain Res-Qs are literally Coast to Coast, and then some!" Participating in the ATV Safety and Rescue R&D Weekend were the management and staff of the Knott County ATV Safety Training Center, instructors from the KDA Farm & Home Safety Program, representatives of ///Emergency Equipment, the crew of LifeNet MEDEVAC helicopter service, members of LaRue County Fire & Rescue, Hazard Fire & Rescue, Ball Creek VFD, Salyersville Fire & Rescue's "Rhino ResQ Team" and personnel from the newly formed Grapevine - Chavies VFD "ATV Rescue Team" of Perry County. In all, a dozen volunteer rescue personnel utilized ten 4X4 ATVs and UTVs, plus four "All Terrain Res-Q Trailers" during the two-day learning experience. 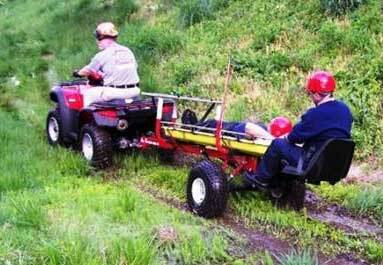 Rescuers in Kanawha County, West Virginia, now have a better way to transport sick or injured persons out of the woods. A new "All Terrain Res-Q Trailer" has been acquired by the "ATV Rescue Team" at Tyler Mountain Volunteer Fire Department in Cross Lanes, WV. Now, rescue team members can safely transport patients from remote off-road rescue scenes to a waiting ambulance, or medical evacuation helicopter, without the need for 8 to 12 men and women to carry 1 person in a litter, or on a backboard. In stead, a 4-wheel drive all terrain vehicle (ATV) will pull the rescue trailer to a scene, where as few as 3 rescuers (the average ambulance crew) can load and transport the patient, while providing emergency medical care throughout the run. Purchased with donations from the community, the new all terrain rescue trailer (ATR) was ordered with several additional options and accessories to assist EMTs and Paramedics as they render aid to the victim. Options, like the attendant's seat and a medical/defibrillator tray, plus a sealed battery powered LED patient light will make patient care easier and more efficient. Also, a new basket stretcher (a Stoke's type litter) with a "1,200 pound capacity" was ordered to be used with the ATV rescue trailer. This basket stretcher has a double fully welded stainless steel frame which, if needed, can be equipped with a bridle sling and hoisted into the air by a technical or rope rescue team, or a rescue helicopter. Delivery of the All Terrain Res-Q Trailer included a 3 hour "Orientation Session" conducted at the Poca Hunting & Fishing Club. Staff members at this private club remarked "This is certainly a lot better than how we have been doing it over the years. I bet we've carried a dozen out on foot since I've been here." TMVFD Lt. James Hill, the ATV Rescue Team leader followed that statement with "We've had 12 calls over the last two-and-a half years in our response area where we could have used this!" While there are a few other departments in West Virginia using off-road trailers for rescue, Tyler Mountain's new All Terrain Res-Q Trailer is the first of its' kind in the state. 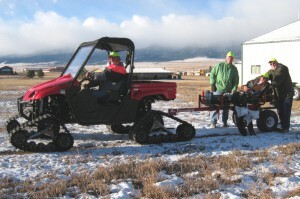 Most of the other ATV rescue trailers in use are homemade designs, or modified small utility trailers. However, the ATR in service at Tyler Mountain was designed and built from the ground up for one purpose: "The safe and efficient transportation of sick or injured persons from off-road locations to a waiting ambulance or medical helicopter." A midmorning, late winter walk with her two dogs ended in a dangerous fall for an unidentified Sandy Hook, Connecticut resident. 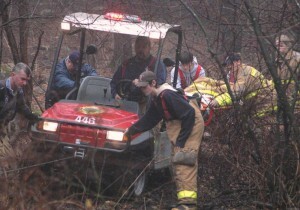 Rescuers from the "Sandy Hook Volunteer Fire & Rescue Company" responded and found the injured woman at the bottom of an extremely steep and muddy embankment adjacent to Gelding Hill Road. The woman is believed to have been down for almost an hour in the cold air and mud before a neighbor heard calls for help. Cold, but conscious and alert, Sandy Hook First Responders discovered the victim was suffering from an ankle injury sustained during the fall. Upon arrival, Sandy Hook's Fire Chief, Bill Halstead, immediately called for "Forest Rescue Unit 446" -- a 2006 Ingersol Rand - Club Car XRT off-road 4X4 rescue vehicle equipped with an All Terrain Res-Q Trailer. Unit 446 is a diesel powered off-road utility vehicle equipped with a 2500 pound winch and the All Terrain Res-Q patient transport trailer. This scene was perfectly suited for the specialized off-road rescue equipment. Before the operation was complete, Sandy Hook's members would learn just how well suited! Assisted by personnel from the Newtown Volunteer Ambulance Corps, the injured woman received 'professional emergency medical care' at the scene. Once packaged in a litter and secured safely on the All Terrain Res-Q Trailer, the patient was monitored by Sandy Hook VFC's EMS personnel riding with her all the way to the top of the hill on the trailer's medical attendant's seat. As wet slippery mud covered frozen ground, rescuers described conditions as "extreme." As such, the conditions required some creative thinking. So, the winch cable from Forest Rescue 446 was deployed and secured to a tree at the top of the steep hill. Remaining along side the off-road utility vehicle, Sandy Hook Volunteers combined the power of the Club Car's 719cc diesel engine with its 2500 pound winch and All Terrain Res-Q Trailer, to safely haul the injured woman up the hill to a waiting Newtown Ambulance. In the words of Karin Halstead, Sandy Hook VFC's EMS Captain: "I really can't give an amount of time it would've taken without the UTV and rescue trailer. But, it would have been a lot longer because the ground was very slippery. Also, there would've been a greater chance for a rescuer to be injured, or the patient to be hurt if one of us fell during the carry out." Manchester Vol. Fire Dept. "ATV Rescue Team" gets 1st SAVE with All Terrain Res-Q Trailer!